[ABOVE] The reverse of carte-de-visite by Charles Grey of the Military Photographic Studio, 67 Lewes Road, Brighton (c1892). 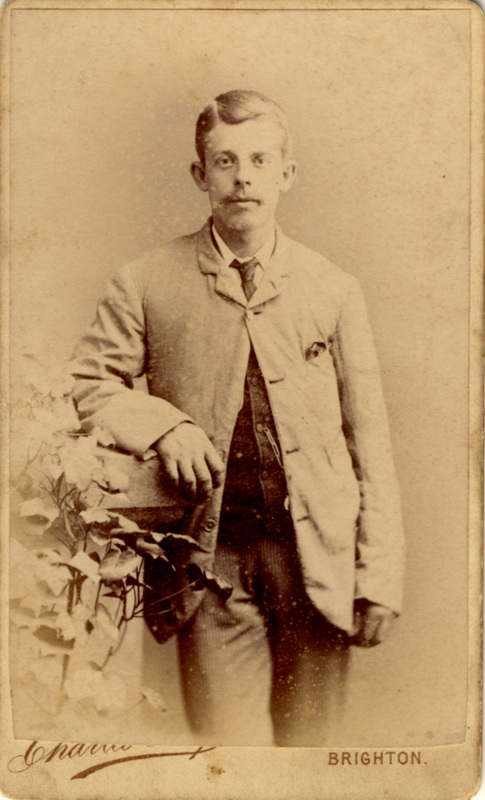 [ABOVE] A carte-de-visite portrait of a young man by Charles Grey of the Military Photographic Studio, 67 Lewes Road, Brighton (c1892). Charles Stephen Grey was the eldest son of the veteran photographer Stephen Grey (1822-1891). Charles Stephen Grey was born in Brighton in 1854 and baptised on 1st October 1854. Charles Grey assisted his father at his studio at 144 Western Road, Brighton as soon as he left school. When the 1871 census was taken, seventeen year old Charles Grey is recorded as a "Photographer" at the family home of 51 Cobden Road, Brighton. Charles's sister, Sarah Jane Grey, aged 19, is also entered on the 1871 census return as a "Photographer" and, presumably, they were both employed at Stephen Grey's studio in Western Road. 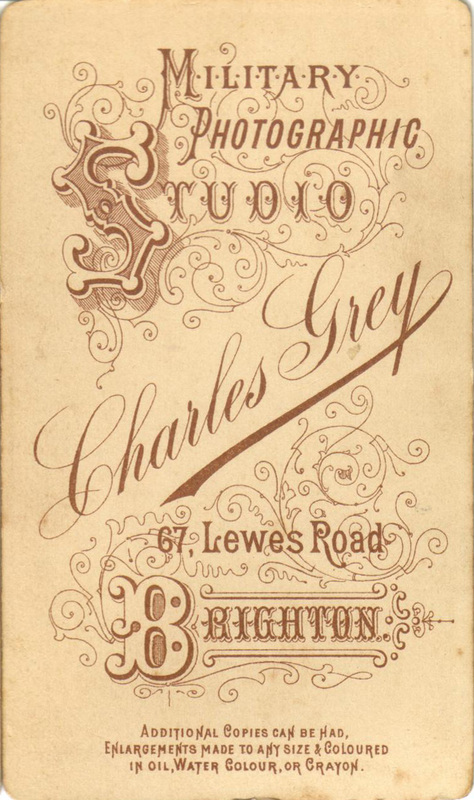 After Sarah Jane Grey married in 1873, Charles Grey became the chief assistant at his father's studio at 144 Western Road and continued in this role when Stephen Grey sold the Western Road studio and returned to his former studio at 13 St James's Street, Brighton. At the time of the 1881 census, Charles Grey was still living with his parents at 51 Cobden Road, Brighton. Charles Grey is described on the census return as a "Photographer", aged 26. 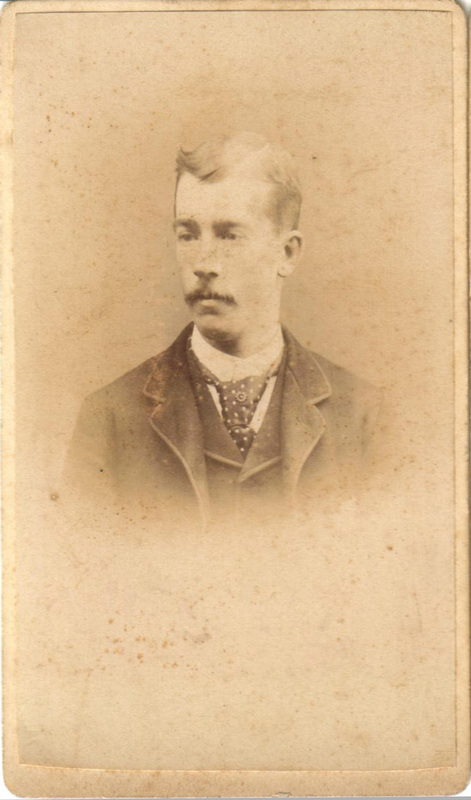 Charles's younger brother, sixteen year old Walter James Grey, is also entered as a "Photographer" on the 1881 census return. By 1882, Stephen Grey had taken his sons into the family business and from this date the studio at 13 St James's Street went under the name of "Stephen Grey & Sons". In 1883, Charles Stephen Grey married Emma Georgina Nash (born 1857 Maidstone or Rochester in Kent), the daughter of Jane and George Nash, a former cavalryman in the 6th Dragoon Guards regiment, who had opened a beer-house in Brighton after he retired from the army. [Marriage of Charles Stephen Grey and Emma Nash registered in Brighton during the Second Quarter of 1883]. In 1885, George Grey's wife Emma gave birth to a daughter named Ivy Beatrice Grey [ birth registered in Brighton during the Second Quarter of 1885]. A son, Percy Charles Grey, arrived two years later in 1887 [ birth registered in Brighton during the Second Quarter of 1887]. The couple's third child, Dorothy Gertrude Grey, was born in 1890 [ birth registered in Brighton during the First Quarter of 1890]. By 1885, the firm of Stephen Grey & Sons had acquired a second studio at 67 Lewes Road, Brighton. Around 1889, Stephen Grey passed on the Lewes Road studio to his eldest son, Charles Stephen Grey. 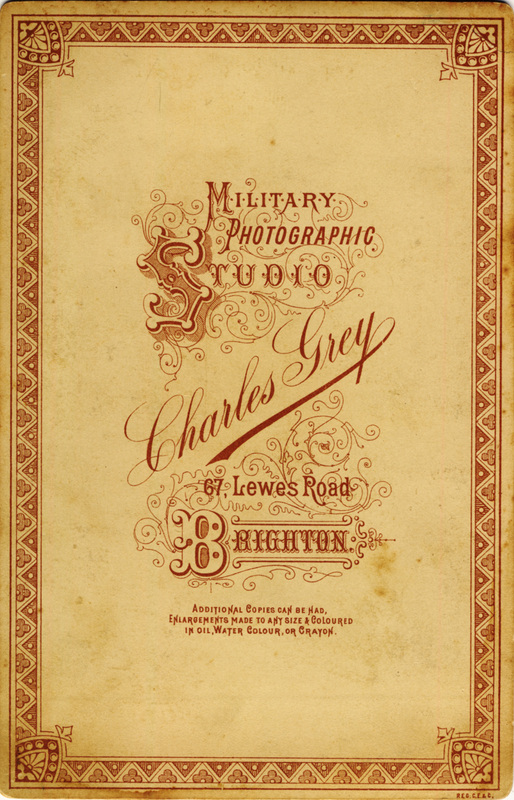 Charles Grey called his photographic studio in Lewes Road the "Military Photographic Studio"; presumably because he wanted to attract the custom of the large number of soldiers stationed at the Lewes Road Barracks in the early 1890s. 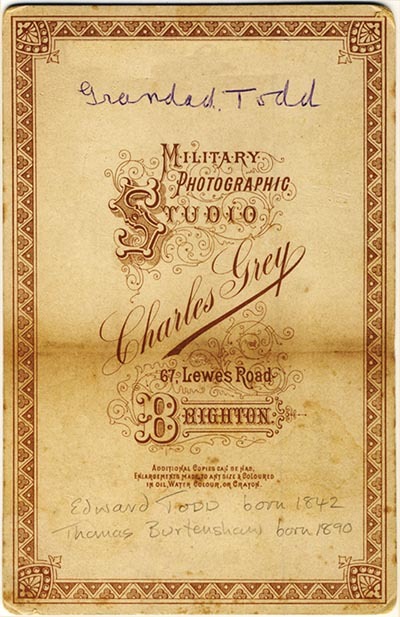 Charles Grey continued to run the "Military Photographic Studio" at 67 Lewes Road, Brighton until around 1896, when it was sold to Ernest H. Jones. Emma Grey gave birth to a son named Thomas George Grey in 1896. [ Birth registered in Brighton during the Second Quarter of 1896]. 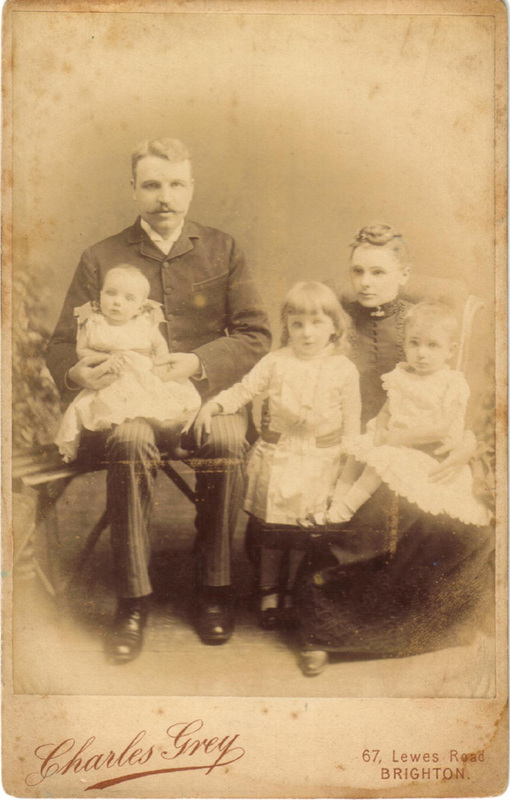 Charles Grey's family are next recorded in Walthamstow, Essex, where his last child May (Mary) Alberta Grey was born during the Fourth Quarter of 1897. In the 1901 census, Mrs (Emma) Georgina Grey is recorded as a widowed boarding house keeper in Portsmouth, Hampshire. Mrs Grey had lost her husband and he cannot be traced in the 1901 census, but Charles Grey was not dead. The 1911 census records Charles Grey as a fifty-seven year old "Photographer", described as a single man, boarding at Royal Oak Cottage, Rottingdean, Sussex. [ABOVE] A cabinet group portrait of a young family by Charles Grey of the Military Photographic Studio, 67 Lewes Road, Brighton (c1892). [ABOVE] The reverse of the cabinet group portrait of a young family by Charles Grey of the Military Photographic Studio shown on the left (c1892). 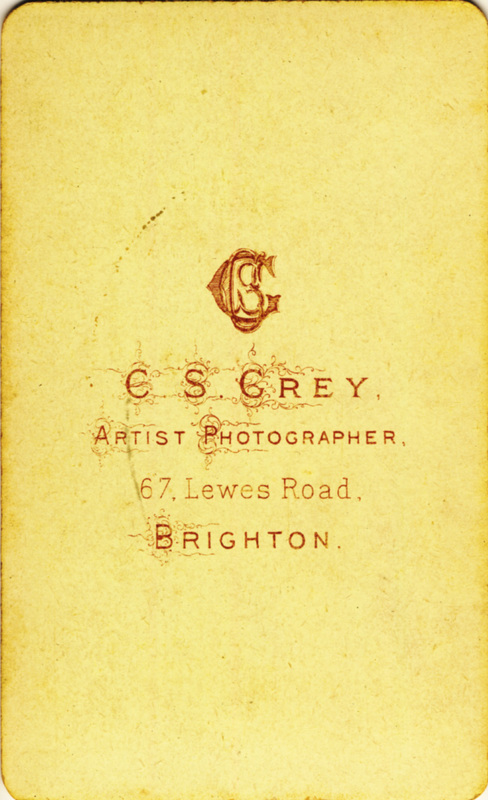 [ABOVE] The reverse of a carte-de-visite, showing the trade plate of C. S. Grey, Artist Photographer, 67 Lewes Road, Brighton (c1890). 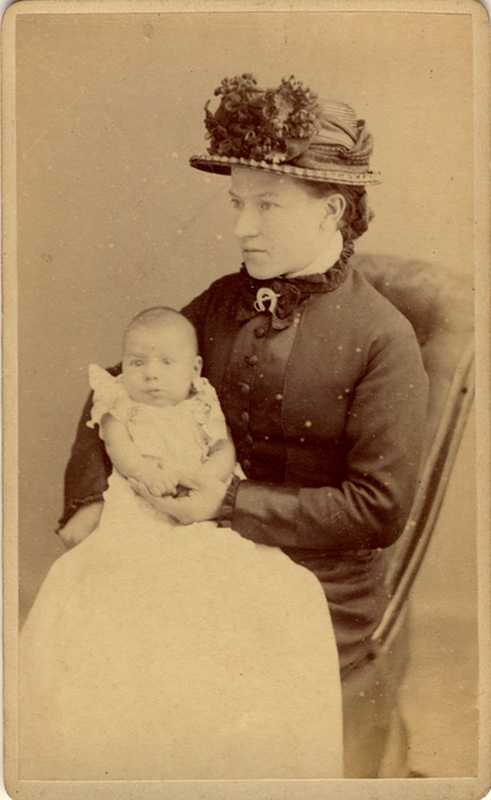 [ABOVE] A carte-de-visite portrait of a young woman holding a baby by C. S. Grey, Artist Photographer, 67 Lewes Road, Brighton (c1890). [ABOVE] A portrait of a young man by Charles Grey of the Military Photographic Studio, 67 Lewes Road, Brighton (c1892). 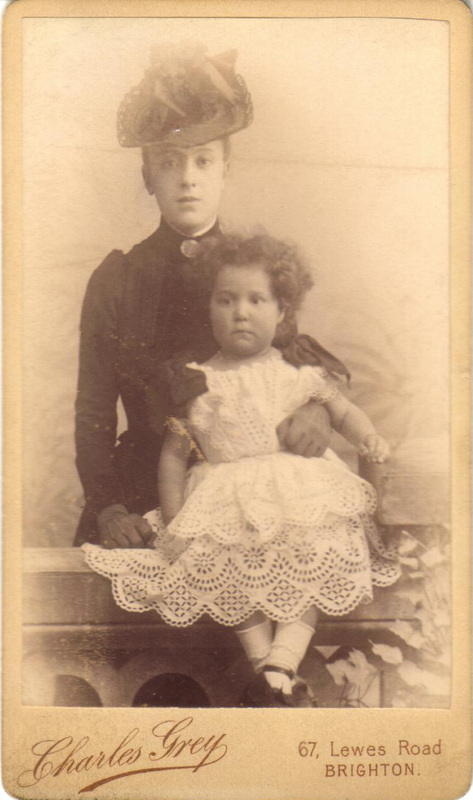 [ABOVE] A carte-de-visite portrait of a young woman with a child by Charles Grey of the Military Photographic Studio, 67 Lewes Road, Brighton (c1892). 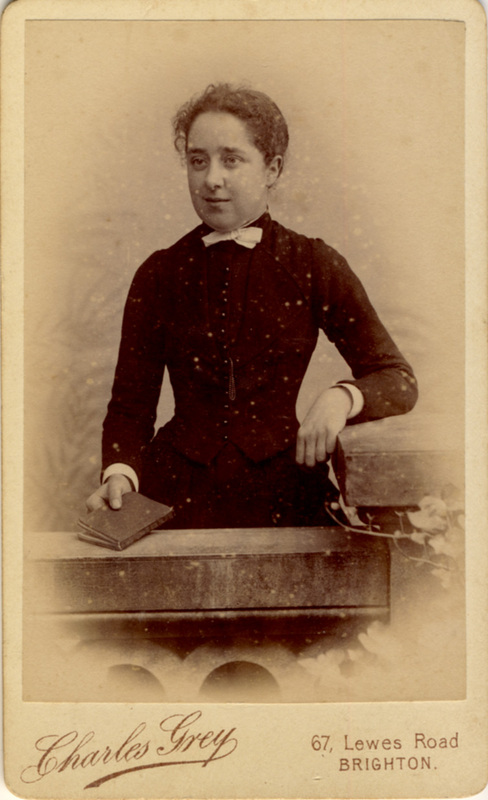 [ABOVE] A carte-de-visite portrait of a young woman by Charles Grey of the Military Photographic Studio, 67 Lewes Road, Brighton (c1891). [ABOVE] The reverse of a carte-de-visite produced by Charles Grey of the Military Photographic Studio, 67 Lewes Road, Brighton (c1892). 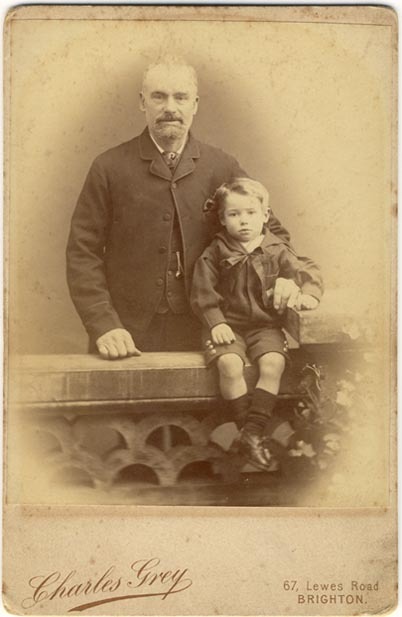 [ABOVE] A cabinet portrait of Edward Todd (born 1842) with his young grandson Thomas Edward Burtenshaw (born 10th October 1890, Brighton) photographed by Charles Grey of the Military Photographic Studio, 67 Lewes Road, Brighton (c1894). [ABOVE] The reverse of the cabinet portrait shown on the left with details of the sitters inscribed in pencil. Thomas Edward Burtenshaw, the young boy featured in the cabinet portrait, had a tragic life. He lost a leg when he was young and he died in 1918 at the age of twenty-eight.